President Trump is a complete surprise to everybody because he is fundamentally unelectable. A vast majority of Americans dislike him. His favorability ratings never got above -9 in the past year while Clinton’s occasionally drifted into positive territory. Hillary Clinton’s staff is claiming that the actions of FBI director Comey were the cause of Trump’s victory. This is kinda sorta true. It fails to recognize that Clinton’s defeat was the direct result of Trump’s abilities as one of the best brand managers in the country. Doubt the description of Trump as a brand manager? He got educated at Wharton, the #2 marketing school in the country according to U.S. News & World Report reports! Through his own individual efforts he’s built one of the great brands in America: Trump. The only way to make Trump electable was by making his opponent, Hillary Clinton, seem like a worse choice. Trump used his ability and skills as a brand manager to identify susceptible segments of the population and crafted his message to appeal to them. Specific inactions of Clinton made Trump’s program effective. On September 9, Clinton correctly identified Trump’s strategy when she segmented Trump supporters into two camps: Deplorables and Left-behinds. Instead of making a direct appeal to Left-behinds she then told her supporters that “Those are people we have to understand and empathize with”. I had thought her segmentation was brilliant but then was puzzled why she did not scoop the Left-behinds up with a targeted uplift campaign. Left-behinds are a natural consequence of globalization where factories move from country to country chasing lower costs and new demand. While workers lost their livelihood, the benefits accrue to the wealthy. The only way to counter this is by taxing the wealthy beneficiaries to provide the Left-behinds with retraining and other support (childcare, for example) so they can grab a piece of the new economic order. As Republicans are focused on cutting taxes, this is a program that Democrats should be able to prove is not coming from Republicans and was part of Clinton’s agenda. Her absolute lack of any emphasis on how her programs would improve the economic welfare of Left-behind voters created a vacuum that Trump filled. Hillary Clinton’s advisors ignored Bill Clinton’s pleas and failed to realize that Trump was appealing to the same, non-bigoted blue-collar voters who had elected Obama (who is a black man) in 2008 and 2012 and Bill Clinton before him. Trump started by promising all sorts of improbable growth and change that he claimed would benefit the Left-behinds. Next, he charged her with being a criminal, supported by fact based but negative independent media on her email server and leaked emails. The void was further filled by appealing-to-the-target but obviously false stories of impending arrests and other investigations. While Trump was portrayed as promising too much and loose with the facts, a minor sin; Clinton was portrayed as a crook. Exit polls confirm that this is the reason why he won. As shown in the chart below, people who strongly favored one candidate over the other picked Clinton, 53% to 42%. Voters who disliked the opponent picked Trump, 51% to 39%. Even so, Trump’s personal nastiness compared to Clinton’s positive personal image (after all, she’s a Sunday school teaching grandmother) means that dislike of her claimed dishonesty would not normally motivate people to get out the vote. Getting out the dislike-Clinton vote required something else: Fresh proof of her dishonesty right before the election. The FBI provided this. FBI director Comey’s October announcement of potentially more damaging Clinton emails triggered a surge in the anti-Clinton vote. Again, exit polls confirm that Comey’s actions were critical in swaying the vote. 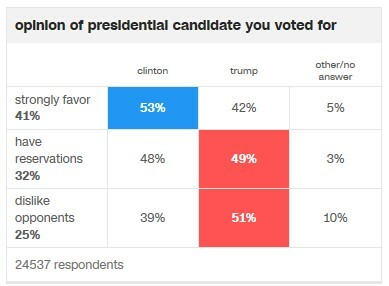 The chart below of when actual voters “decided how to vote” shows the breakpoints as Trump’s strategy gained traction. First, there was a dramatic drop in support for Clinton from those who decided before the Deplorables speech (52% for Clinton) to September (46% Clinton). Comey’s October announcement was the death stroke: Clinton support dropped to 37% of deciders. Only in the last few days after Comey declared the investigation had found nothing new did Hillary’s numbers recover to 44%. Note that this increase in the last few days refutes Democratic statements that the 2nd announcement was worse than the original. The major affect of Comey’s announcement was an increase in turnout of Trump voters that was totally unprecedented and a decrease in Clinton voters that broke all the models. None of the pollsters correctly read what was happening and none of the pundits who claimed to have seen this increased turnout before the announcement were correct: It only happened because of unpredictable actions by the FBI so they couldn’t have forecast it. However, there is no excuse for researchers and Clinton strategists to have missed this shift as it occurred. The September shift would have been obvious in every unadjusted poll as it happened. Any decent brand manager would’ve noted and reacted to this trend. Apparently, Clinton had too many researchers and political strategists and not enough marketers who have worked in the real world. Note: The exit poll above is a shared poll of 24,537 voters sponsored the National Election Pool, a consortium of ABC News, The Associated Press, CBSNews, CNN, Fox News and NBC News. Predicting what’s gonna happen under Trump is difficult because some of the things he’s claimed he’s going to do are unlikely to pass his own Republican-controlled Congress. Some things are certain to occur: tax cuts, changes to health care, and certain types of deregulation. Some things are possible but face budget barriers with infrastructure spending being the most likely to be reduced or eliminated. Before you say I left it out: All that social stuff on the Supreme Court, gay-rights, and abortion: Very unlikely to have an economic effect though they will be a catalyst for the 2018 elections. Research shows that tax cuts to the wealthy have very little effect on spending. Only the part of Trump tax cuts that benefit the lower 90% of income groups will have any immediate effect on aggregate economic activity. 62% of the Trump tax plan will go to the top 10% of income. The Ryan plan is slightly different but still very concentrated to the rich. Tax cuts will increase the deficit which, à la Minsky, increases corporate profits which may have a benefit on the stock market. The deficit will not cause any economic stress even if it explodes government debt to well over 100% of GDP. Historically, government debt has gone as high as 240% (Great Britain and Japan) with minimal effect on growth. Remember: All that research on a catastrophic deficit cliff has been debunked due to arithmetic errors. Deficits per se do not increase growth or inflation when at the zero lower bound (ZLB) of interest rates. The tiny so far increases in interest rates to approximately what they were last year is not indicative of a move off the ZLB. The Federal Reserve’s almost certain interest rate increase in December 2016 will greatly decrease the likelihood of increased inflation, exactly as it is intended. Faster growth will lead to faster increases by the Fed as they try to normalize short term rates, another drag on growth. Overall, anticipation of inflation will probably push rates higher than economic activity merits, slowing growth. While deficits may not cause economic growth, government spending paid for by increased deficits can increase economic activity as Trump is well aware. All of the central bank monetary stimulus has primed the pump for fiscal stimulus which the Republican Congress was unwilling to do under a Democratic President – things have changed. Unfortunately, increasing deficits from tax cuts will reduce the willingness of House Republicans to increase infrastructure spending. Direct infrastructure spending is much more effective than tax cuts at generating growth. It’s in the arithmetic: Tax payers save part of a cut while the government would spend all of it. Military spending will also generate growth but less than infrastructure spending – it does not add to the economic base. Expect strong growth if a large infrastructure program is passed in Trump’s first 100 days. Replacing Dodd-Frank with Glass-Steagall is effectively a deregulation as Glass-Steagall is no longer sufficient to regulate today’s lending markets. Eliminating part of Dodd-Frank is probably not going to cause any immediate problems as long as capital requirements remain in place. If capital requirements are eliminated, there is a high likelihood of a Minsky moment type crisis as occurred in 2008. Because the financial markets are significantly more leverage than they were in 2008, this crisis could occur quicker than most will anticipate – possibly within 2 years. Even if Trump reduces many environmental regulation there is unlikely to be much change due to local activism. The business benefit will be highly specific rather than benefiting broad groups. Coal is unlikely to come back because it’s being killed by low natural gas prices which are likely to continue for the next 30 years due to environmentally friendlier fracking. Changes in automobile efficiency goals will have minimum effect on industry profitability. It makes life a little easier but they would’ve been able to handle the original goals. Small business may benefit as they may be able to compete in areas that had previously been ruled out due to environmental regulations crafted by large players that only they could afford to meet. Insurance companies are fighting the elimination of Obamacare because they’re afraid of the combination of being forced to insure people with pre-existing conditions combined with no universal mandate forcing people to buy insurance. Essentially, this would put every insurance company out of business as no one would buy insurance until they got sick. People would leave employer plans in droves if there was a viable individual insurance market option. House Republicans will be the deciders on what happens to healthcare and they are likely to be much more aggressive than insurance companies would like. The current House plan prevents insurance from being refused due to preexisting conditions and does not require universal insurance but has a “penalty” for late enrolment outside of the original signup period. Employer plans will still provide the majority of insurance as the individual insurance market will almost certainly collapse if insuring pre-existing conditions is maintained without a universal mandate. Pharmaceuticals may benefit if attention is taken off of efforts to lower drug prices. There is a slight possibility that consumer confidence will be negatively impacted by the election of Trump. A recession could occur if the anti-Trump crowd panics and starts increasing savings rates. The next few months of consumer confidence and holiday sales data will indicate what’s occurring in this area. Currently this data is positive. Investors should follow the monthly Conference Board Consumer Confidence Index and the weekly Bloomberg Consumer Comfort Index for early indications of changes in consumer spending. While almost all of Trump’s stated trade policies would have negative effects, it is unlikely that anything truly harmful will be enacted. It’s difficult to change existing treaties quickly. The Trans-Pacific Partnership has very marginal, if any, benefits which are offset by possible negatives so it is no loss. The Paris Agreement climate change treaty does not go into effect until 2020. The anticipated tax cuts will benefit the wealthy and will increase concentration of wealth. Job growth should increase at least in the short term, potentially increasing wages for the middle class and working poor. It is unlikely that Trump will be able to increase the minimum wage as promised but this will benefit the lower income groups if passed. Unless Trump develops new programs for rural areas, economic forces will concentrate benefits in the anti-Trump urban areas. Overall, Trump’s election should result in at least a short-term boost in economic activity, provided he passes expected tax cuts and spending measures in his first 100 days. Negatively affected will be insurance and healthcare companies due to changes in healthcare. If there is no decrease in consumer confidence (or hopefully an increase) consumer spending should continue to buoy the economy. Interest rate increases may choke off the economic expansion if they occur rapidly. If financial deregulation of capital requirements is done there will almost certainly be another fiscal crisis, possibly quickly. It appears that the Left-behind will continue to be left behind. Do Public Employees make 43% More or Have Private Employees lost 31.2% of their compensation since 1980?